It was a cloudy and misty day, and she was wearing her glasses, black leggings, tiger print hoody, and high top black combat boots that she never laced up all the way. He was more nervous than he had ever been before. Six years ago, Trevor Young and Heather Lankford became friends on Facebook through mutual acquaintances. They often talked - sometimes for days on end usually followed by radio silence, only to be picked up again several months later. Three days after Trevor turned 21, on that spitfire rainy day, Trevor finally met his forever love face to face, and together they adventured into the first of many dates. Natural conversations about nothing ensued as they ordered their beers at The Bearded Lady off Magnolia street in Fort Worth. As the day came to a close, and they walked back to their cars, Heather’s glasses began to fog up, and tiny raindrops made their presence known on her lenses. They leaned into kiss, the rain picked up, but the kissing didn’t stop. Heather was ending an arduous relationship when Trevor physically stepped into the picture of her life, and at this point - because of her previous experience, she knew exactly what she was looking for. As their second date came to a close, and with a heart full of dread, Heather expressed where she was at emotionally. She has a list of character qualities she was looking for in a guy, and Trevor just didn’t seem to fulfill that. However, the evening had a dramatically different ending than anything she could have ever expected. Nearly 18 months later, Heather, Trevor, and I slid into a hard, red, plastic, booth in a Monahans, Texas Dairy Queen after a full evening shooting their engagement session at the Monahan Sandhills State Park. 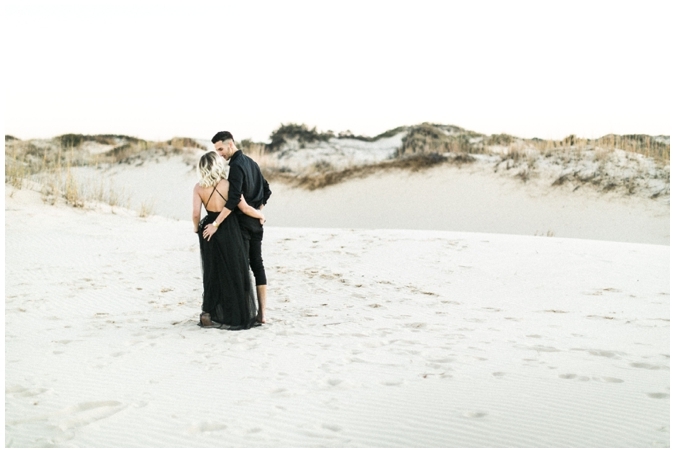 As their wedding photographer, I have the unique opportunity to get an inside look at who these two are together, and a wild road trip out West was the perfect complement to their wild love. As we waited patiently for our blizzards, Marry Me by Train began to play in the background. Trevor’s eyes welled up as he started reflecting on the love, support, and patience Heather has brought to his life. A few months ago Trevor was in a life-threatening dirt-bike accident, and Heather was terrified that something was going to be wrong with his brain long-term. “It really puts things into perspective,” she said. Trevor was looking at eight months suffering from constant headaches and temperature changes because of the nerves damaged in his brain. He was not able to be active for six months, with his face swelling up from time to time in the process of his skull healing. “She never left my side. When I was in the emergency room, she got extra chairs from another emergency room just to make a bed so she could stay next to me,” Trevor said. Heather’s nails are black with a slight point and accompany her edgy, girl boss, style perfectly. After a few days in the emergency room, she needed to slip away from Trevor’s side to grab a bite to eat. Heather slowly slipped her hand out of Trevor’s, as her friend slid hers in so she could step out for a minute, but it did not take long for Trevor to feel Heather’s friend's fingernails. “I love her so much, and pay so much attention to everything that I could feel her nails and know it wasn’t her,” Trevor said. After walking through such a terrifying life event, he knew that he was ready to make a big commitment, and a big commitment was exactly what he planned to ask on his families upcoming cruise. “It was the last thing I ever expected to happen after his accident - I just didn’t see it coming,” Heather said. Around 3 or 5 p.m., on the sparkling beaches of Cozumel, Trevor clumsily got down on one knee and asked for Heather’s forever. 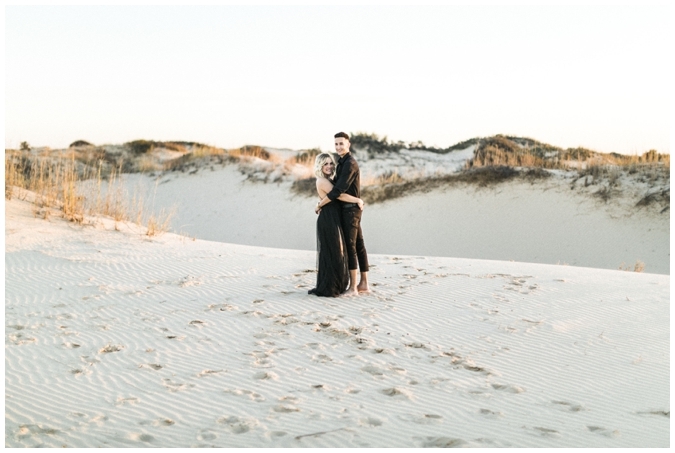 The yellow specs of sand blew like dust over our feet as we began shooting their engagement session. The sunlight was soft, in contrast with the strength that their relationship exudes.